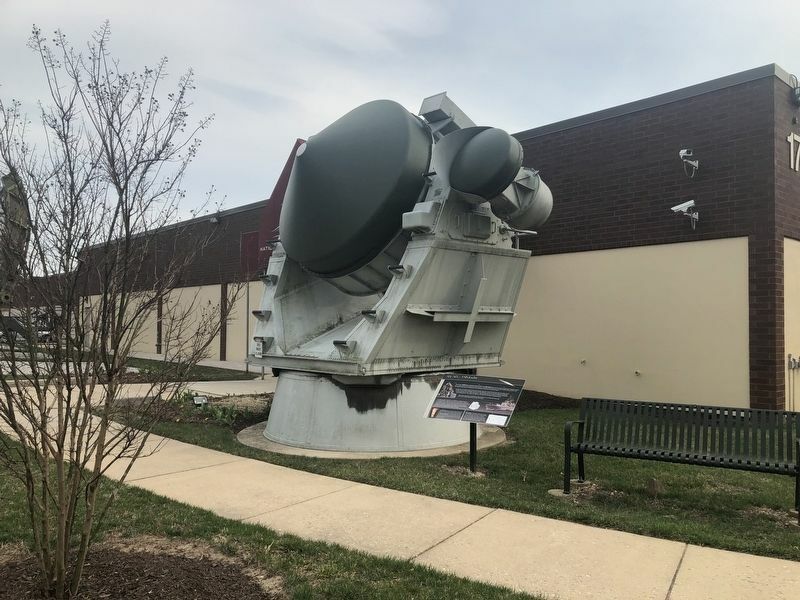 The US Navy's AN/SPG-55 is a tracking/illumination radar for the beam riding Terrier and semi-active homing RIM-67 Standard missiles. It was a major component of the MK76 Fire Control System used in fleet and area protection. The Navy deployed early variants in the mid 1950's and the system's final deployment was in Operation Desert Storm in the early 1990's. 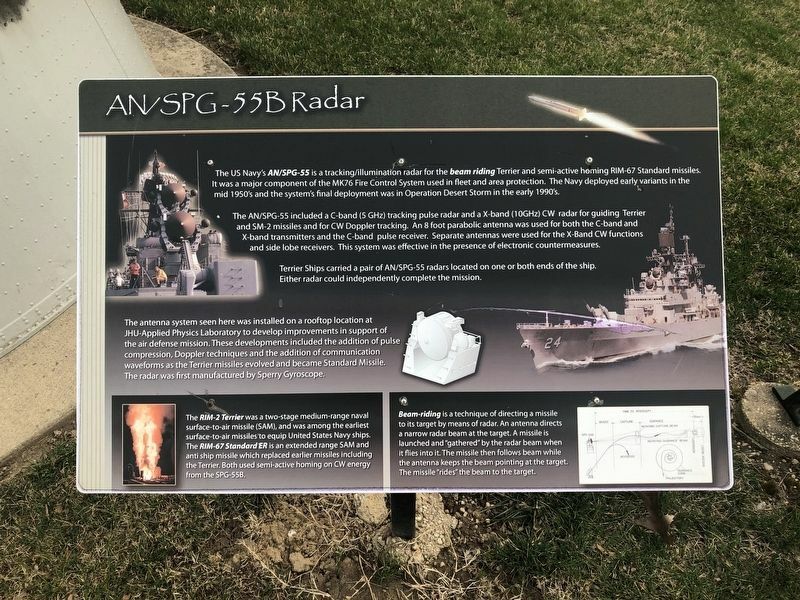 The AN/SPG-55 included a C-band (5 GHz) tracking pulse radar and a X-band (10GHz) CW radar for guiding Terrier and SM-2 missiles and for CW Doppler tracking. An 8 foot parabolic antenna was used for both the C-band and X-band transmitters and the C-band pulse receiver. Separate antennas were used for the X-Band CW functions and side lobe receivers. This system was effective in the presence of electronic countermeasures. Terrier Ships carried a pair of AN/SPG-55 radars located on one or both ends of the ship. Either radar could independently complete the mission. included the addition of pulse compression, Doppler techniques and the addition of communication waveforms as the Terrier missiles evolved and became Standard Missile. The radar was first manufactured by Sperry Gyroscope. The RIM-2 Terrier was a two-stage medium-range naval surface-to-air missile (SAM), and was among the earliest surface-to-air missiles to equip United States Navy ships. The RIM-67 Standard ER is an extended range SAM and anti ship missile which replaced earlier missiles including the terrier. Both used semi-active homing on CW energy from the SPG-55B. Beam-riding is a technique of directing a missile to its target by means of radar. An antenna directs a narrow radar beam at the target. A missile is launched and "gathered" by the radar beam when it flies into it. The missile then follows beam while the antenna keeps the beam pointing at the target. The missile "rides" the beam to the target. Location. 39° 11.758′ N, 76° 41.056′ W. Marker is in Linthicum Heights, Maryland, in Anne Arundel County. Marker is on Elm Road east of West Nursery Road, on the right when traveling east. Touch for map. Marker is at or near this postal address: 1745 West Nursery Road, Linthicum Heights MD 21090, United States of America. Touch for directions. Other nearby markers. At least 8 other markers are within 2 miles of this marker, measured as the crow flies. SCR-270 Radar Antenna (a few steps from this marker); TPS-43 (a few steps from this marker); Nike Ajax (within shouting distance of this marker); FuG 65 Wurzburg Riese (Giant) Radar Antenna (within shouting distance of this marker); XAF Radar Antenna (about 300 feet away, measured in a direct line); Stoney Run Train Station (approx. 0.9 miles away); Elkridge Furnace Inn (approx. 1.6 miles away); Linthicum Heights (approx. 1.8 miles away). Touch for a list and map of all markers in Linthicum Heights. More. Search the internet for AN/SPG-55B Radar. Credits. This page was last revised on March 31, 2019. This page originally submitted on March 31, 2019, by Devry Becker Jones of Washington, District of Columbia. This page has been viewed 93 times since then. Photos: 1, 2. submitted on March 31, 2019, by Devry Becker Jones of Washington, District of Columbia.